Harper Blaine was just an average small-time private investigator until she died - for two minutes. Now Harper is a Greywalker, walking the thin line between the living world and the paranormal realm. And her new abilities are landing her all sorts of strange cases. In the cold of winter, Pioneer Square's homeless are turning up dead and mutilated, and zombies have been seen roaming the streets of the underground - the city buried beneath modern Seattle. When Harper's friend Quinton fears he may be implicated in the deaths, he persuades her to investigate their mysterious cause. Harper and Quinton discover a pattern to the deaths in the city’s past that points to an inhuman killer stalking the modern citizens of the Underground. But when Harper turns to the city's vampire denizens for help, they want nothing to do with her or with the investigation. For this creature is no vampire. 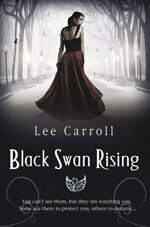 Someone has unleashed a monster of ancient legend upon the Underground, and Harper must deal with both the living and the dead to put a stop to it... unless it stops her first. The first novel (Greywalker) introduced readers to the hidden paranormal world of Seattle while the second novel (Poltergeist) gave Harper some murders and the paranormal phenomenon of a poltergeist to investigate. My major criticism of Greywalker was that the Grey descriptions were long winded yet confusing to read. Poltergeist was a much stronger book, less stumbling about in the Grey mists and more paranormal investigation, although the technical explanations for the poltergeist did seem unnecessarily laboured in a couple of places. After all fantasy readers are generally happy to suspend their disbelief – a weird phenomenon doesn’t need explaining to death. Underground builds on the previous novels and successfully strikes the right balance between the paranormal and logical mystery investigation. On the paranormal side of the equation we have zombies in Seattle’s Pioneer Square and a powerful monster of Native American myth roaming the underground places of the city making the zombies. On the side of logical investigation we have Harper and her friend Quinton investigating the increasing number of missing and dead homeless people in the city. The dead bodies have been partially eaten although everyone in authority seems to want to pass them off as something more normal, such as depredation by feral dogs. Asking questions amongst the homeless population and following leads takes Harper into hidden underground parts of the city that she never dreamt existed. There she and Quinton follow more clues that lead them to the startling conclusion that there is an ancient monster loose in the city. The paranormal elements of the story are not over explained, leaving the monster with its magical mystery intact. The investigative parts of the story are both realistic and well planned out, meaning that mystery fans won’t be disappointed either. 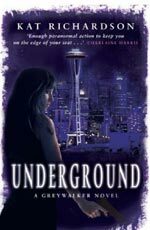 Monster hunting action and a little romance thrown into the mix make Underground extremely readable and Kat Richardson’s best book yet. Underground doesn’t have a huge amount of vampire action in it but there is an appearance from the usual vampire suspects (Cameron, Carlos and Edward) although they are just their normal manipulative, tricky vampire selves and of no help to Harper in her monster hunt. Fast-paced and creepy, Underground makes for an intelligent read and is a great addition to this urban fantasy series – not to mention it has mythical monsters too. Fantastic! You can find out more information about the novels of Kat Richardson and read an excerpt from this book on the author’s website. Visit Kat’s website.